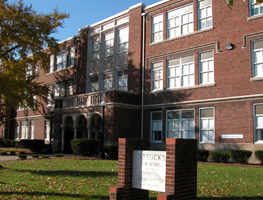 The Indianapolis School Board opened Crispus Attucks High School in 1927 as the first and only public high school for African Americans in the city. Designed by well-known Indianapolis architects Harrison & Turnock, the high school is not only important in education and social history, but also architecturally for its Collegiate Gothic/Tudor Revival style and terra-cotta detailing. Before Crispus Attucks High School was constructed, Indianapolis had a number of segregated elementary schools, but African Americans were able to attend public high schools. After World War I, with the rise of the Ku Klux Klan and demands of segregationists, a delegation of the Indianapolis Chamber of Commerce petitioned for a separate high school. Despite the opposition of the Better Indianapolis League, a civic organization of progressive black citizens, prominent black citizens, and black churches, the school board voted unanimously to build a separate high school in 1922. Archie Greathouse, a black community leader, held up construction with a series of court challenges, but the school board prevailed. The board decided to name the new school “Thomas Jefferson High School.” This resulted in numerous petitions to change the name to “Crispus Attucks High School” in honor of the former slave killed in the 1770 Boston Massacre, who is generally considered the first to die in the American Revolution. The high school became a strong source of pride in the black community when it opened in 1927, despite initial opposition. Though taxed for space and equipment, faculty was the best available, hired from traditionally black colleges in the south. Students were taught a special course in black history as well as the usual subjects. School segregation was outlawed in Indiana in 1949, but the student body remained almost exclusively African American until the 1970s, when busing for racial integration began. The brick exterior of Crispus Attucks is Tudor Revival in style, with glazed terra cotta moldings. The plan is a good example of school layout from the early 20th century, using ample banks of windows for light and ventilation. The triple-arched entry is also framed in terra cotta moldings on the interior; the corridor leading to the entry has a matching terra cotta archway. Crispus Attucks High School is located on the near northwest side, at 1140 N. Martin Luther King, Jr. St. The interior includes a museum open by appointment only by calling 317-226-2430. INDYGO bus line from downtown: #34 Michigan Rd., disembark at West and Indiana stop; walk north to building.